임진왜란 3대 대첩 가운데 하나인 진주대첩을 승리로 이끈 진주목사 김시민(1554-1592)에게 내린 선무공신 교서이다. 선무공신교서는 1604년(선조 37) 10월에 임진왜란 때 전공을 크게 세운 장군들에게 내린 것으로, 이순신, 권율, 원균 등 총 18명의 명단이 적혀 있다. 이 공신교서는 김시민 장군의 공적과 그에 따른 포상내역이 자세히 언급되어 있을 뿐 아니라 현존하는 선무공신교서 가운데 보존상태가 가장 좋은 것으로 임진왜란사 연구와 고문서 연구의 중요 자료가 된다. 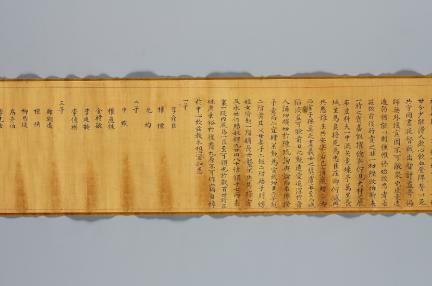 This Royal Certificate was posthumously awarded to Kim Si-min (1554-1592) who, as a local magistrate, led the country to victory in the Battle of Jinju, one of the three greatest battles during the Japanese invasions in 1592-1598. 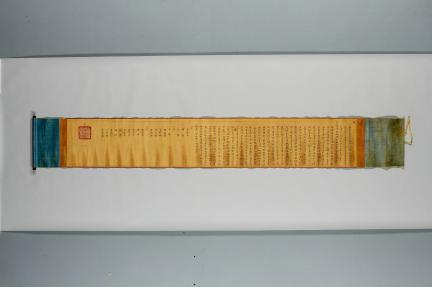 The certificate contains the names of all 18 generals and admirals who rendered distinguished services during the war, including Yi Sun-sin, Gwon Yul and Won Gyun. They were all cited in the 10th lunar month of 1604 (the 37th year of King Seonjo’s reign). The certificate details Kim’s achievements and the prizes granted to him. It is in the best condition of all the royal certificates of military service from the Joseon Dynasty, and is highly valued as a source for historical and bibliographical research.